Elliot Whittier has adopted this scholarship fund to assure that a grant of $500 may be awarded annually to a graduating Senior from Winthrop High School in perpetuity. The scholarship was established in 1998, from proceeds of the Oceanside Big Band & Jazz Fest, in loving memory of jazz trombonist and Winthrop Orthodontist, Dr. Gene DiStasio. 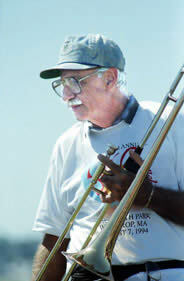 Dr. Gene encouraged Paul Roy, a former principal at Elliot Whittier to produce the first free outdoor concert at Hannaford Park in Winthrop in 1994. Gene played trombone for the Kenny Hadley Big Band that year. He died in 1995. The recipient is selected by the scholarship committee at the High School with the advice of the Band Parents.